This is a lesson that I tried with a 5th grade class to give a context to decimal addition and subtraction. Most of the math problems I’ve found involving decimal computation seem “artificial.” They have a “real world” connection, but the connections are irrelevant to most 5th graders. In order to make the connections more relevant (as Dan Meyer posted in a recent blog: students want to solve it) I came up with a context for a problem that had the math content embedded, but also involved the students in the problem itself. Credit for this lesson needs to go to a 3-5 EBD class at my school. The students in this class about 3 yrs ago, loved to make tops out of connecting cubes. They did this because they were told that they couldn’t bring in any toys to class (Bey Blade was the hot toy at the time). Since they couldn’t bring in these spinning, battle tops, they created their own with connecting cubes. The first time I witnessed these students spinning their tops, the big question they wanted to know, was whose top spun the longest. I filed the idea away until about a week ago when some 5th grade teachers at my school asked for some help with decimals. The following is the lesson I used – thanks to this class of students. It’s written as it was done. I know what I’d change when I do it again. Please take a look. Use it if you like. I’d love to hear about your results and how you change it to make it better! 5.NBT.1 Recognize that in a multi-digit number, a digit in one place represents 10 times as much as it represents in the place to its right and 1/10 of what it represents in the place to its left. 5.NBT.3 Read, write, and compare decimals to thousandths. a. Read and write decimals to thousandths using base-ten numerals, number names, and expanded form, e.g., 347.392 = 3 × 100 + 4 × 10 + 7 × 1 + 3 × (1/10) + 9 × (1/100) + 2 × (1/1000). b. Compare two decimals to thousandths based on meanings of the digits in each place, using >, =, and < symbols to record the results of comparisons. 5.NBT.7 Add, subtract, multiply, and divide decimals to hundredths, using concrete models or drawings and strategies based on place value, properties of operations, and/or the relationship between addition and subtraction; relate the strategy to a written method and explain the reasoning used. Give students a copy of the decimat and ask what decimals might be represented. Follow up with these possible questions: What might hundredths or thousandths look like? How could you use this to model 0.013? 0.13? Share your thoughts with your partner/team? 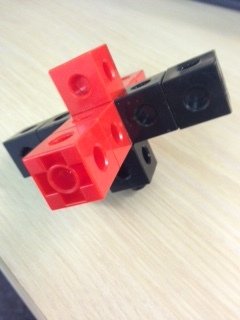 The task is to design a spinning top, using connecting cubes, that will spin for as long as possible. Your group may want to design 2 or 3 tops, then choose the best from those designs. Once a design is chosen, students will spin their top and time how long it spins using a stopwatch. Each group will do this 4 times. 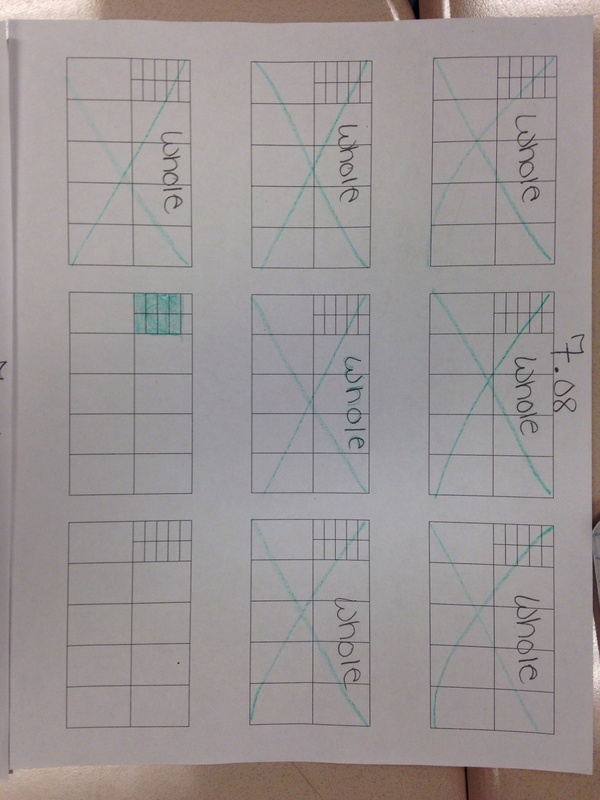 Students should cross out the lowest time. Students will then use models and equations to show the total time for the top three spins. Students will show, on an empty number line, where the total time for their three spins lies. Students must justify their placement of this number on a number line. Students present their tops and their data, then compare their results. Whose top spun the longest? How much longer did the longest spinning top spin than the second longest spinning top? Show your thinking using a model. How many of you would change your design to make it spin longer? 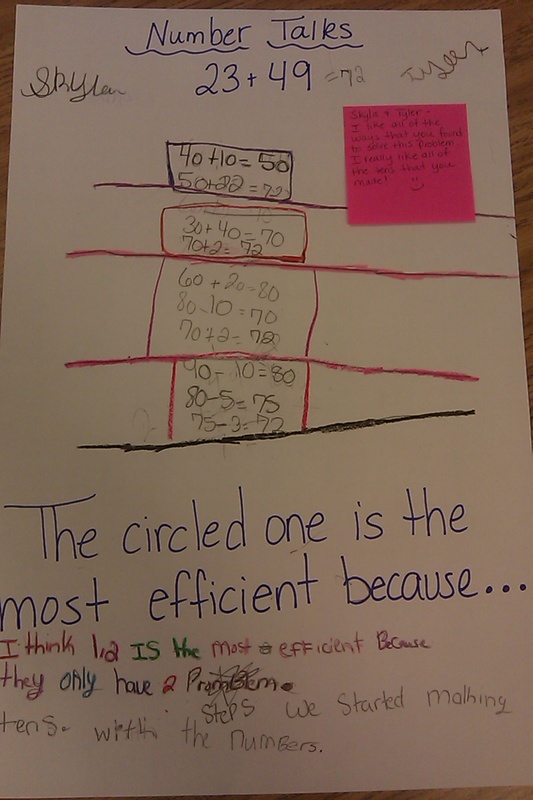 Students used models to explain their thinking to each other and construct viable arguments. Had a great night the other night with my (almost) 14 year old son. Connor had some math homework (Pythagorean Theorem worksheet from an outdated math series) and I was just looking over his work, making sure he understood the concept. He was coming along ok, I guess, so he finished up and sat on the couch to veg. for a bit. Now, at first I thought what happened next was fate, but the more I think about it my subconscious probably took over. I checked my email and saw one from earlier in the week that I wanted to look at. It was from Dan Meyer’s blog and had a couple of links that I wanted to check out. After about 20 minutes of looking at some stuff I hadn’t seen before– including Estimation 180 (great site by the way), I stumbled upon Dan Meyer’s Taco Cart Problem again and began to grin. Since I was on the couch with Connor by now, I showed him the video. When it ended abruptly, he said, “THAT’s IT!” I asked what was wrong. He said, “I want to know who gets there first.” We started to talk about it and maybe 20 minutes passed. After realizing this was difficult to do with the limited resources we had on the couch, he asked, “Can we go sit at the table and work this out? These numbers are too big.” I said, “SURE!” (but in a subdued voice so as not to sound “giddy” in front of my teen-aged son). We sat there for a while talking about what he needed to know. He knew he needed to know how far each person needed to travel, but didn’t make a connection about what he knew about the Pythagorean Theorem to solve the problem. Yes, problem solving should be at the heart of every lesson! He hadn’t been introduced to any ideas about distance and rate, but he knew he needed to know how fast they walked. We talked about the relationship of distance, rate, and time and how these relationships can be use to find solutions to problems like this one. After a little discussion and a lot of questions, Connor got to work. He stumbled with some of the fraction “mechanics,” but with a little questioning, came through just fine. Connor did more thinking during this task than I’ve witnessed him doing in a long time. He was engaged from the start and he would not stop until he figured it out. This is what students need to do all day in math class! At the end, it was beautiful! He not only solved the problem, but when I asked where the cart should be for both people to get there at the same time, he was ready to go. He marked a new spot, and figured out the new distance. We had to set it aside, though, because it was getting late. He wants to see how close his placement of the taco cart is for the two guys to get there at the same time. We’ll be looking at it again over the weekend! Kim, my beautiful bride, stopped at the table and asked what he was doing. He told her, then she asked him if he finished his math extra credit (he doesn’t really need it – it’s just improving his grade, not really improving his understanding of mathematics). I found it a bit humorous because he was learning more doing this problem, than by doing the extra credit sheet of 19 naked equations. Context and comprehension mean everything in mathematics! Connor just recreated his thinking through the Taco Cart problem below using the Educreations App. Enjoy! A Number Talks Reflection – A Look Back Over the Past 3 Years. . .
Before reading this post, you may want to check out the GloSS and IKAN diagnostic math assessments from nzmaths at this website: http://www.nzmaths.co.nz/mathematics-assessment. These assessments are diagnostic interviews that teachers use with students. When students respond with answers to the problems posed by the teacher, the teachers have to listen to students’ reasoning, not just the answer. The information gathered is incredibly powerful and has driven our teachers to ask for resources and strategies that will help their students grow and progress through these developmental stages. I introduced number talks to my school during pre-planning three years ago. I read the book the previous summer and knew it would be a success if I could just get my teachers to try it. The challenge for me was to find a reason for them to want to try this new thing called number talks in the midst of all of the other new initiatives. I looked at what we had been doing over the past year and a half and tried to find where these number talks would fill a need. When I discovered that need, several (more than I expected) teachers wanted me to introduce number talks with their classes immediately – during the first week of school! 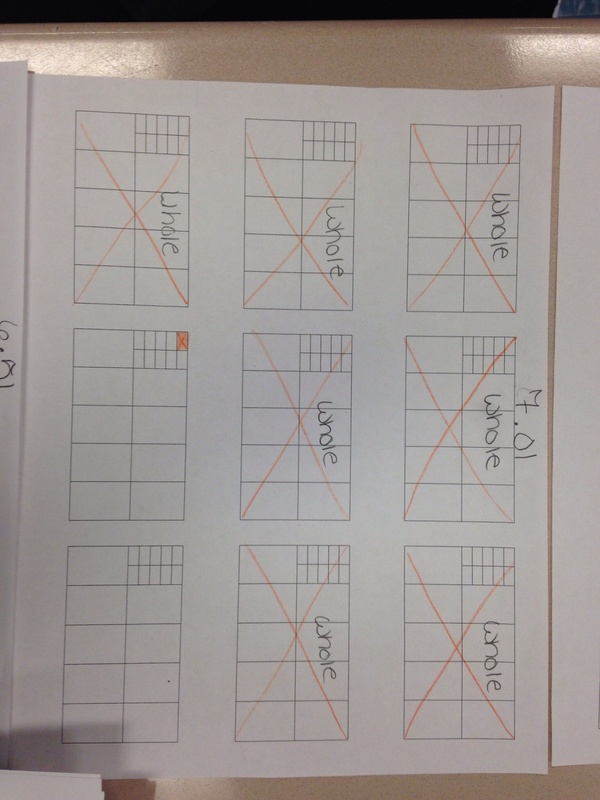 The need I found was to improve strategies for computation to help students achieve higher strategy stages on the GloSS assessment. Teachers had noticed that students were getting stuck on stage 4 (basically, the majority of students – even those in 5th grade – had one strategy for everything, counting on). They were stuck because we continued to assess, but hadn’t looked at the data gathered from those assessments to come up with a course of action to help students. The ideas were out there and we had discussed strategies before, but few teachers were implementing these ideas daily. We wanted the pig to grow, but we were weighing it instead of feeding it! When I started introducing the number talks, teachers were very interested and many were excited about out how this would work. I worked with each teacher/class for an entire week. For four days, I would model the number talks. On the fifth day, the classroom teacher would take over and I would observe. We would meet after to talk about the experience and we would discuss how the teacher would move forward from this point. Sometimes these were difficult conversations. What I learned from these discussions was that many teachers thought of this as a magic bullet, where teachers would talk about strategies first and then have students practice a few verbally. This myth was dispelled as soon as I walked into the first classroom. I introduced number talks to every class that year. Some teachers wanted to see them, and then decide whether to use them. Some knew they wanted to use them, and some just wanted 4 days with someone else teaching for 20 minutes. And there was one skeptic, who did number talks with the expectation that they would not work. And that was ok. It wasn’t mandatory, just a strategy. A tool to use to help kids help themselves. I would check up on teachers every so often to see how teachers and students were doing with their number talks. Some had stopped doing them after a while, some only did them 3-4 days a week, but there were some… Some who saw the value right away and did them religiously (I apologize for this blatant disregard of separation of church and state) every day. These teachers took number talks and ran with them! They not only used them to help students develop strategies, they used them to assess those strategies. They were asked to share. And they did. During professional learning, faculty meetings, and through emails, other teachers began to notice that the number talks were beginning to show results. 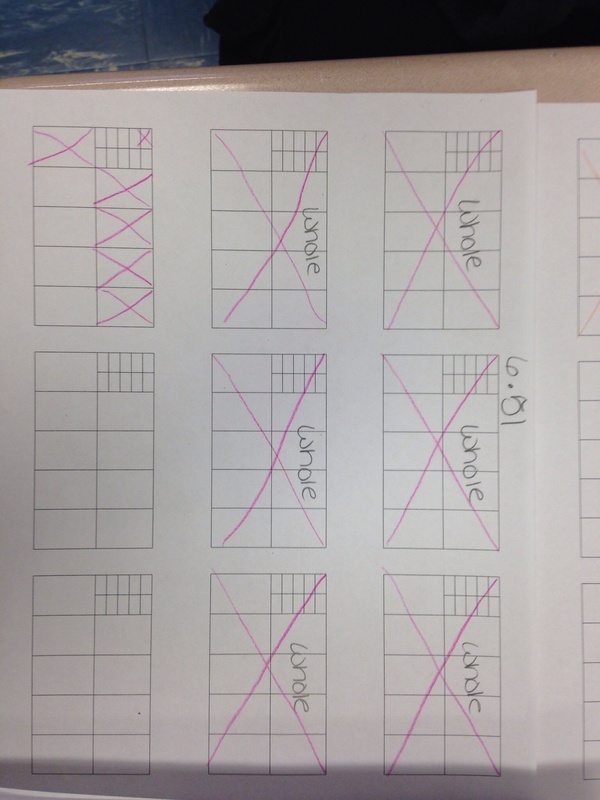 Teachers were amazed, and so was I, when one month after introducing number talks to a third grade class, I walked in just to see what was happening and saw student after student mentally adding two three digit numbers using strategies based on place value, friendly numbers, and compensation. These were a mixture of Special Ed., EIP, Title, and Gifted students. They were all at different places in their understandings of the strategies they were hearing and using, but because they were developing the strategies, they were empowered to keep trying to use them and develop new strategies that were efficient (quick, easy to think about, and work every time). Number talks have been a huge success for all teachers at my school who have used them with fidelity. We’ve hired some new teachers this year and they seem just as eager to learn about number talks as the teachers I worked with a few years ago. Now, with all of this experience and several number talks experts, our school can offer more support than ever to these new teachers. We’re all expecting the best. Oh, and remember the skeptic. . . well, she’s one of the experts now!